Who knew that eating delicious food could save kids with cancer? 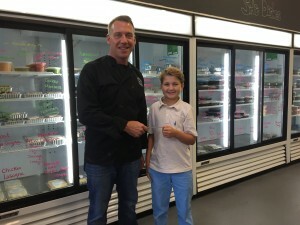 Shawn Russell, owner of Fairfield’s Cinch gourmet meal market, did. When he opened the market four years ago, he knew he wanted to make a difference in the lives of families. His goal was to make dinnertime easier by creating healthy, easy, delicious prepared food for busy families who love food, but don’t always have time to cook. He also wanted to help those families, and yes, help kids. Cinch Food partnered with TeamBrent to help fight childhood cancer. TeamBrent was inspired by Southport’s Brent McCreesh, who is now over ten years cancer free, but TeamBrent continues to fight for all children. Brent’s favorite food is cheese ravioli, so the TeamBrent cheese ravioli was born. Cinch Food has donated a portion of every single sale of its very popular cheese ravioli to TeamBrent since the day they opened. That’s a lot of ravioli! Dana McCreesh, cofounder of TeamBrent, says “We are so grateful and proud to be partnered with Cinch. Their ravioli is unbelievably good. My kids cannot get enough of it – and I serve it to them guilt free, knowing that the ingredients are the freshest and I’m helping fight childhood cancer with every meal. Dinner made easy for sure!” McCreesh also explained that this latest check was going towards TeamBrent’s neuroblastoma vaccine (GVAX) trial. TeamBrent has partnered with Dr. Lisa Diller MD, chief medical officer of Dana-Farber and the clinical director of pediatric oncology at Dana-Farber Cancer Institute and Children's Hospital Boston to help create this vaccine, which will be given to patients at the DFCI in the next few months.